SAN DIEGO, Calif. — Interim HealthCare, the nation’s largest combined provider of home care and healthcare staffing services, announced the completion of conversions of the San Diego/Escondido, Fresno, Sacramento and Modesto/Stockton branches into franchise operations. Previously, operating under corporate ownership, the change reflects the continuous growth of the 42-year-old company and a strategic move to becoming an all franchise organization. Under this branch to franchise conversion, the San Diego/Escondido offices’ new franchise partner is Wendy Olayvar; the Fresno offices’ franchise partners are Sarah Ahmed, Wayne Campbell and Samerah Campbell; the Sacramento offices’ franchise partner is David Klaeser; and the Modesto/Stockton offices’ franchise partners are Ron and Anita Murphy. Interim HealthCare, Inc. is the nation’s leading provider of comprehensive home health and health care staffing services. Through a franchise network of more than 300 offices, the Company serves patients and clients across the United States. Interim is a single source for skilled nursing; physical, occupational and speech therapy services; hospice services; non-medical home care assistance; occupational health; physician locum tenens and other related services. Interim employs more than 75,000 health care workers and provides services to approximately 50,000 people each day. 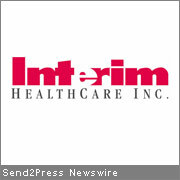 For more information, visit http://www.interimhealthcare.com .